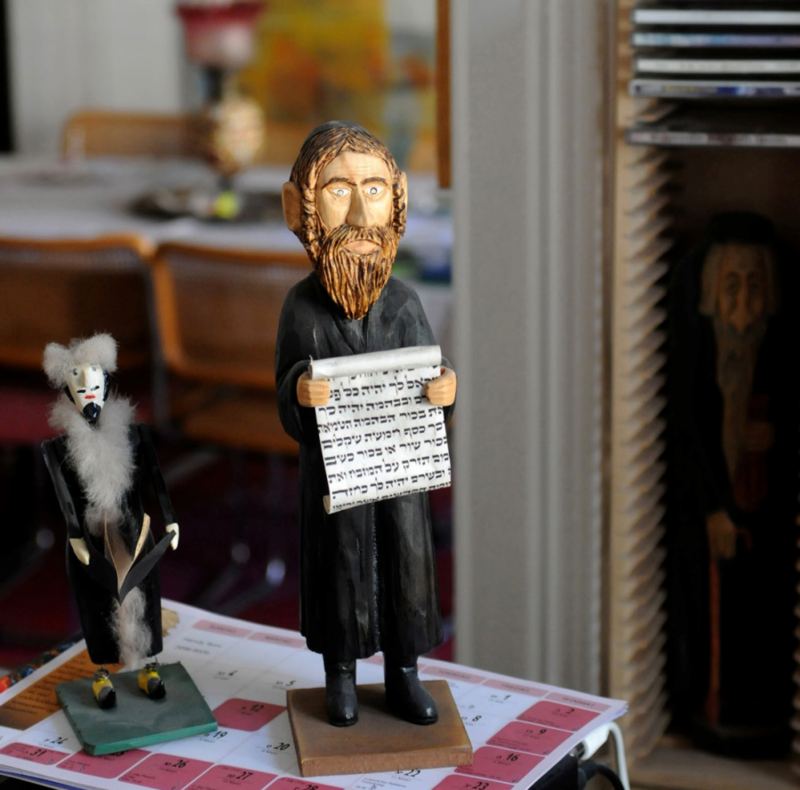 Wooden carvings of Jewish figurines remains a tradition in Poland. A Concordia research project is engaging such discussion on the tradition of carving wooden figurines of Jews, travelling to Krakow, Poland to exhibit their work at the end of the month. Organized by professor Erica Lehrer, Souvenir, Talisman, Toy: Jews for hearth and home, will be presented as part of Krakow’s Festival of Jewish Culture from June 25 to July 14. Lehrer, an associate professor in the history and sociology and anthropology departments, is the director of the Centre for Ethnographic Research and Exhibition in the Aftermath of Violence. She also holds the Canada Research Chair in Post-Conflict Memory, Ethnography and Museology. Lehrer is presently in Krakow and will be joined by public history honours student Lauren Ramsay and English and creative writing honours student Lizy Mostowski. Ramsay became involved with the CEREV after taking Lehrer’s Museums and Heritage in the Globalized World class. Ramsay has been working on the exhibit since September and is in charge of sound design for one of the gallery spaces as well as writing a joint article with Lehrer. Mostowski became involved after contacting the director of the Krakow Jewish Community Centre, Jonathan Ornstein, who informed her about the exhibit organized by a Concordia professor. Tasked with media relations and communication, she plans on tweeting photos of the exhibit and the festival in Krakow. She wants to put some of the questions they designed to prompt conversation on the Twitterverse. “It would be cool to continue the dialogue and I want to carve [the Twitter account] as an archive,” said Mostowski, whose parents are from Krakow and Warsaw. Poland had the largest Jewish community in the world before the Holocaust. Since the end of World War II, Jewish culture disappeared and few Jews remained in Poland. Recently hit by a Jewish revival, Poles are reconnecting with the Jewish culture and reviving its Jewish landscape of synagogues and cemeteries. Lehrer’s exhibit will display figurines by Polish carvers depicting Jews. The majority of these figurines are from personal collections in Poland, and some are from abroad. Oftentimes craftsmen carve these figurines simply for the art of it, although most sell their work. Today, most carvers have never met any Jews—the exhibit’s featured carver Józef Reguła, for example, learned about Jewish history out of his own curiosity. After an army friend taught him to carve wood in his twenties, he started carving Jewish figurines in the ‘90s at the request of his brother-in-law, a director of a regional museum. He was asked to make figurines in a time where carvings, especially of Jews were popular in museums. The goal of the exhibit is to create a dialogue between the Jewish tourists and the Polish community. The exhibit presents a history of figurines to encourage visitors to discuss their importance in Jewish and Polish identities. “People connect to each other through talking about the objects,” said Ramsay. “It’s about confronting a difficult past and confronting a complicated contemporary relationship between where non-Jewish Poles create items of Jewish culture,” said Ramsay about the importance of the exhibit and of the figurines. Located in the J. W. McConnell Building, the CEREV has a gallery on the sixth floor and an work-room on the 10th floor. The gallery is a research and experimental curating space and the work-room is reserved for members to meet and prepare digital exhibit elements. This latest exhibit is one of many projects by the CEREV. Previous work includes Inuit and Residential Schools, which portrayed the illustrated memories of eight Inuit survivors of the traumatic federal program, and a collection of interviews entitled Palestinian Canadian Life Stories. The centre hosts lectures and events and offers workshops and trainings in different subjects related to the aftermath of large-scale violence and conflict, providing opportunities for students to participate in interdisciplinary work.